Below is an example of the GeodesyML format. This is how GeodesyML is used to encode information about a GNSS receiver installation at a site. This information is traditionally stored in Section 3 of a text-based IGS Site Log. The information in both GeodesyML and the text-based format are the same. The GeodesyML version however is in a form that is easily machine readable while remaining human readable for those who need it. The ‘geo’ tag at the front of each line is known as the namespace. In this case, the ‘geo’ signifies the GeodesyML namespace. Other namespaces are used when referring to other standards. based on internationally recognised data exchange methods. GeodesyML is a proposed Application Schema of the existing Geography Markup Language (GML) which is an ISO Standard (19136:2007). 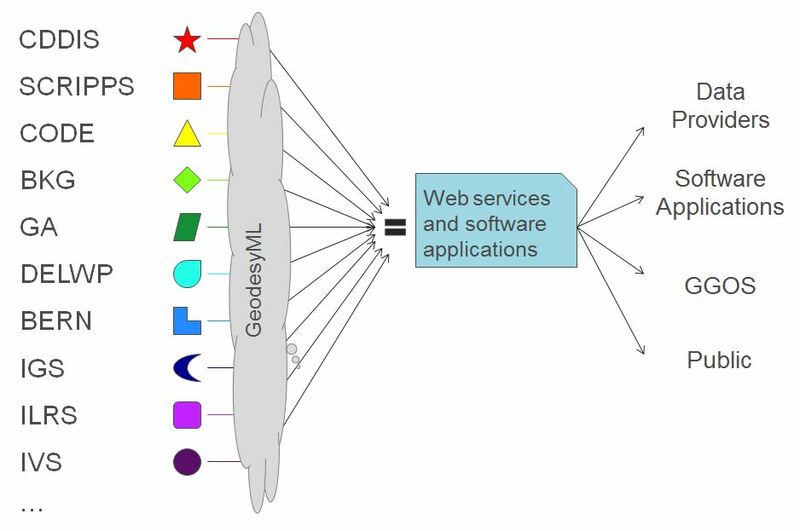 Being an Application Schema simply means GeodesyML extends GML using GML specifications to meet the specific needs of the geodetic community. Almost all proprietary and open-source software vendors (ESRI, MapInfo, Integraph, APOLLO, FME, QGIS, GeoServer) and database technology providers (Oracle, Microsoft SQL Server, ArcSDE, PostGIS, DB2) support GML and many standard application schemas. By supporting GML, vendors adhere to the adoption of new application schemas in their update cycle. Implementation of GeodesyML requires ‘mapping’ GeodesyML to the information as it is persisted (stored) in your data system (including your database). This will likely require assistance from IT specialists. Each agency / jurisdiction has its own way of storing data (physical model) with its own database structure. To implement GeodesyML, it is necessary to ‘map’ your data system (which includes your database) to GeodesyML. This ‘mapping’ is a well known method in the IT industry but requires an IT specialist to perform the task. The GeodesyML developers have created some guidelines and code to assist IT specialists with this task. For more information, see the GeodesyML for IT specialists FAQ page. Mapping to GeodesyML does take expertise and time. It is however important to remember that in order to achieve the benefits described above, some form of mapping would need to occur irrespective of the transfer standard adopted. That is, it is not a requirement specific to GeodesyML. Below is an example of different agency / jurisdiction physical models can be mapped map it to a standard format (GeodesyML) to improve the interoperability and discoverability of data and metadata. By using GeodesyML instead of a custom namespace, we are ‘standing on the shoulders of giants’ of GML and OGC and gain access to the discoverability and interoperability that GML provides. GML along with OGC WFS provides better 1) interoperability than would be provided with custom data models and 2) discoverability using standard query protocols. Yes. Please have a look at the presentations available on the GeodesyML Information page. Support for implementation is available on the GeodesyML for IT specialists FAQ page. If the information on this link doesn’t explain what you need, then please send an email to geodesy@ga.gov.au and we will do our best to provide further support.